Pierate - Pie Reviews: Say No to the Pie Tax! Say No to the Pie Tax! The Pierateers live a simple life. We sail around until we find pie, then we eat pie, talk about pie, dream about pie, drink pints of gravy and occasionally make people walk the plank for eating a slice instead of a pie. Normally we don't have to take an interest in politics. Until someone tries to whack 20% on top of the price of our staple food. I'll just recap what the proposals mean. All food which is sold "above ambient air temperature" will become subject to VAT, whilst those products that are served "at or below ambient air temperature" will not be. On the face of it, when a fish and chip shop has to charge VAT on a pie it sells it does seem unfair that the bakery around the corner can sell it without VAT. However, as the chief executive of Greggs bakery explains to the Guardian the proposals as they currently stand do not work. Greggs cook their pastry products and then sell them as they cool down. They are not heated up again when purchased. I can attest that I have often been into Greggs and had pastry products which have been dried out and stone cold (it's strange how that now works in their favour). Would they have to check the temperature for every product? What happens on a hot day? Will we end up with two queues in Greggs, one for hot and one for cold food? Any of these options are ridiculous and unworkable. It will also hit some companies very hard. They have been working for years on a particular business model and now a £2.50 pie will cost £3.00 which will reduce sales and some business will struggle to cope. But the main reason to oppose such a tax is that it is almost entirely regressive. The less well off are the ones most often buying these products and are going to be hardest hit by the Pie Tax. This comes at a time when many are already struggling to get by. There are many petitions going around calling on the government to scrap the plans. One at Greggs stores has allegedly collected over 200,000 signatures. There has been talk of protests in bakeries up and down the country. It has been viewed as highlighting the North-South divided as well as the class divide. The government has been called out of touch and Cameron's claims to have last had a pasty at the West Cornwall Pasty company in Leeds station were cast into doubt by the fact it closed down in 2007. 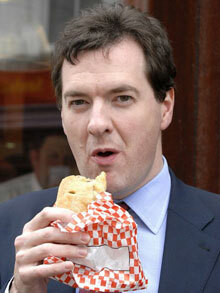 But the real issue here is why are people calling it the 'pasty tax'? Pies are equally affected by the tax and the beef pie is the number one selling pastry product (ahead of the sausage roll). It is really the 'Pie Tax'. Labour are looking to challenge the Pie Tax and other aspects of the Coalition budget. Parliament has to approve the Budget before George Osborne's changes can be enacted. We will keep you up to date here at pierate.co.uk. Remember, if the worst case scenario does happen it will be a great excuse to eat as many pies as we can before the VAT kicks in. Finally! Someone standing up for the masses of pie eaters out there. Get behind the campaign pie lovers! What’s the Point-ins in that?! Not your normal pork pie.